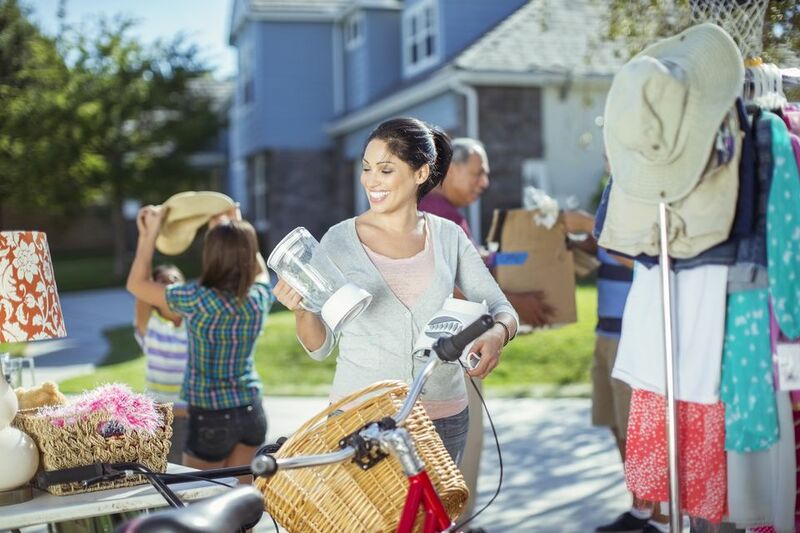 Yard sales can be a great way to declutter your home while bringing in some extra money. Yet, a poorly planned sale can be much more work than it's worth. Organizing a yard sale starts with planning and preparation to ensure a smooth, stress-free, and profitable sale. Yard sales sound like an easy endeavor, and they are quite simple, but they can also be stressful. You have to dig out all the things your family no longer wants or needs, organize and price your items, advertise the sale, gather tables, run to the bank for petty cash, and set up the merchandise. It's a lot of work but if you keep a few things in mind and stay organized and on-task, you can avoid many costly mistakes. Yard sales don't organize themselves and they require a significant time investment. Estimate how much time you think it's going to take to get everything done, then triple (or at least double) the hours to get a more realistic number. Something always comes up, and it always takes longer than you first anticipated. Use a yard sale checklist as you get ready for your sale. Refer to it frequently to keep yourself on track. Check to see if your city or county requires yard sale permits. If you live in an HOA, make sure you're allowed to have a yard sale because some won't let you. Schedule your yard sale for the first weekend of the month if you live in a small town where the shopper pool is limited. Quite often, it's when people who get paid once a month receive their checks and almost everyone has more expendable cash right after payday. Check your city's yard sale listings in the weeks before your sale. Look in the local newspaper and on websites like Craigslist. Get familiar with the typical starting times in the area, and schedule yours at the earliest of those times. Even better, schedule it to start 15 minutes earlier. Serious yard sale shoppers plan their routes in advance, and they aim to be the first shopper at every sale. If your sale starts a little earlier than the rest, you'll be their first stop. Check with friends, family members, and neighbors to see if they'd like to make it a group sale. You'll have more help before and during the event, and more merchandise to advertise. Savvy yard sale shoppers prioritize those listed as multi-family, block, or neighborhood sales—especially the latter. Who knows, you might even start a new neighborhood tradition. Consider keeping a potential sale item if you start having sentimental pangs. You can always sell the piece at a future sale, but you won't be able to get it back. Go to a few yard sales in the weeks leading up to your sale, especially if you don't usually go to them. You'll learn the local yard sale norms and can get ideas on display and pricing as well as what to avoid. A number of common mistakes can cost you time and money, which defeats the purpose of having a yard sale. The biggest key to success is knowing when to schedule your sale to attract the most buyers. There are some days and times you will definitely want to avoid. Don't schedule a yard sale for an "off" day; Friday and Saturday are traditional yard sale days. In some towns, it's becoming common to start on Thursday, but only when the sale runs on Friday and/or Saturday too. Sundays are fine for the second day of a Saturday sale but don't make it the primary day unless it's customary in your area. Don't schedule your yard sale on Labor or Memorial Day weekends. If the Fourth of July falls between Friday and Monday, avoid having your sale on that weekend as well. Though you'll still have some shoppers, many folks schedule trips or family events on holiday weekends. On the other hand, if you live in a vacation-friendly location, you might want to schedule your event for those holidays because travelers love to shop. Don't set a starting time that's later than other yard sales in the area. By the time your sale starts, your potential customers may be out of both steam and cash. Don't wait until the last minute to start getting ready for your yard sale. Definitely don't put it off until the night before! It's no fun staying up all night before a 7 a.m. sale. If you don't end up canceling, you will end up swearing to never hold another sale.